Mary S. Lawrence : Surf Riding in Hawai'i, 1912. Ginn and Company, Boston, New York, 1912. An instructional childrens' book with many photographs. The illustration and photograph reproduced here are from a contemporary work. Note that Lawrence reports the ancient religious ceremonies used during the construction of canoes, transposed by Thrum to surfboards in 1896. 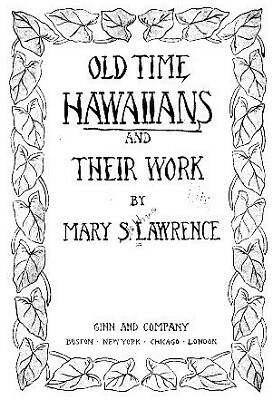 1912 Mary Charlottee Alexander : Story of Hawaii. Extracts and illustrations from Story of Hawaii., American Book Company, New York, c1912. One day the children were surf riding, " See the little keiki, " exclaimed Lehua, who was taking a sun bath with Manuia after a vigorous swim. There was Keikiwai standing on his surf board, balancing himself fearlessly as he rode in on a huge breaker. Then he changed his position and stood on his head.
" Why, that is better than I can do," said the proud father, excitedly. "But wait! he will have a tumble before he reaches shore." Every one stopped to watch him, for it took much skill to keep his position. As he neared the shore he gave his board a mighty push which sent it upon dry land, and then dived into the water and disappeared from sight. The people cheered, for few experienced men could have done better in so rough a sea.
" He is surely a child of the sea god," said Manuia ; " I will take him to fish with Kaipo and me." The making of a canoe was important, and needed the favor of the gods. So the canoe builders went first to the kahuna, who offered sacrifice and prayers to different gods. The kahuna then went with the men to help them find the right tree in the forest; sometimes they climbed several thousand feet above sea level before they found it. For the best canoes he chose koa, which is a hard wood. He watched the elepaio, or woodpecker, and chose some tree that the bird did not bore into. This was rudely shaped, and then ropes were tied to it, and it was dragged down to the seashore. The canoe was made long and narrow so that it would go swiftly. right-handed or left-handed adz which had been invented by one of the canoe gods. The gunwale, or moo, was made of strips of wood fastened to the upper edge to meet at bow and stern. It was usually six or eight inches wide, and was tied with cord or fastened with wooden pegs, and was put on to make the canoe higher. The moo was made of a yellow wood called ahakea and remained the natural color when the body of the canoe was painted black. 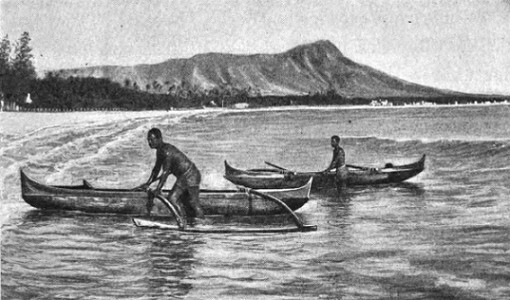 The ama, or outrigger, was a steadier, made of a curved log of wiliwili, which was fastened to the canoe with iako, or branches of the hau tree. Most of the canoes were less than 50 feet long. The fishing canoe of Kamehameha V is in the Bishop Museum. It held four men besides the king, and its dimensions are: length, 35.5 feet; depth outside, 27 inches; inside, 23.5 inches; width outside, 23 inches; inside, 17.5 inches; center of canoe to center of outrigger, 10,7 feet. The paddle was usually 5 feet long, the blade 12 x 20 inches. The launching of a canoe needed the services of the kahuna. A sacrifice was offered, and then tlie owner and the kahuna stood at the bow of the boat. The latter recited a long prayer while the canoe was being launched. Any noise at that time was a bad sign; perfect silence meant that the canoe was safe. The old-time Hawaiians were fond of games, and their outdoor sports made them strong and alert. The games in the water heljaed them to be better fishermen. Little babies were taught to swim, and they always liked to play in the water. Boys became experts in jumping from high precipices, and in diving, floating, and swimming under water or with their feet interlocked. Surf riding is still the national sport. on the edge of the wave and to steer it so that the wave carries us along. In those days the boards were larger, and riders could change their position while surfing. They liked to stand as they rode in. Sometimes they rode the surf in frail canoes, which is the most popular way at the present time. The wooden surf boards were painted black. After being used they were dried in the sun, rubbed with coconut oil, wrapped in tapa, and hung inside the house. There are in these Islands many steep hills covered with long slippery grass. Most of us know what fun it is to slide down them upon ti leaves. In olden times a sled called the papa holua was used on prepared courses or slides called holua. There is one in the Bishop Museum which shows you how very long and how very narrow such a sled was. It took much practice to keep one's balance upon it. In making ready to slide, the person stood back of the brow of the hill, the sled held by the side piece with his right hand. He ran swiftly to the beginning of the slide, then grasped the other side with his left hand, fell flat upon the board, steadied himself with his feet upon the back crosspiece, and shot headforemost down the holua, sometimes a distance of half a mile. How are games good for people ? What different things could the Hawaiians do in the water ? Can you do all those things, or different ones ? Why is surfing difficult ? How were the boards stored ? Why did the old-time people value the boards and take better care of them than we do to-day ? How do you slide downhill? What kind of sled did the Hawaiian have, and how did he use it? Kamehameha I was born one stormy night in November, 1736, at Haiawa, Kohala. Part, at least, of Kamehameha's boyhood was spent at his home in Haiawa, Kohala. There he and his companions played many games. He grew to be strong and fearless, and led the others in wrestling and in hurling the spear, also in surf riding and coasting. Ginn and Company, Boston, 1912. Geoff Cater (2013) : Mary S. Lawrence : Surf Riding in Hawai'i, 1912.